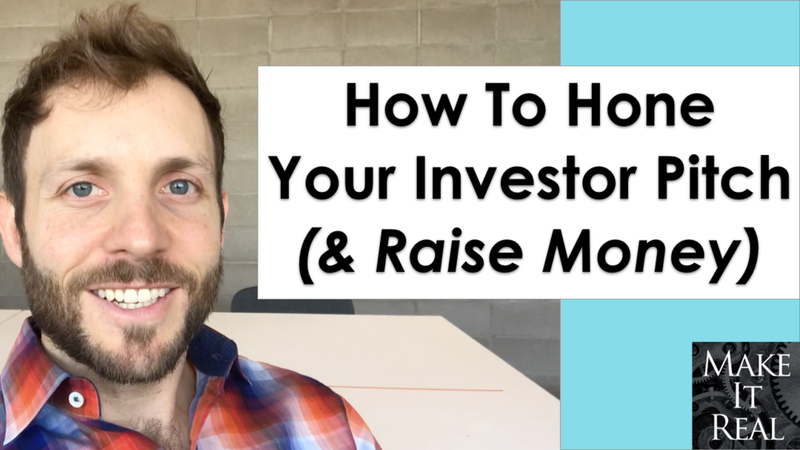 Note: i) this post was transcribed from this video, and ii) This post is the second in a series where I go into detail on each of the 10 steps in my 10 step framework for raising investor money for a startup. To read a summary of the entire framework click here. Let's talk about step two. So step two is practicing your pitch. What this means is when you've got your pitch to the point where you truly believe in everything you're saying and you've done all your research and homework, now you're going to go out and practice the heck out of it with real people. The reason you practice is because pitching is storytelling. You're not just putting up a bunch of numbers on a slide and telling people you're building a billion dollar company. You have to tell a story that captivates people's interests. Investors invest in a story and practicing your pitch is going to help you hone yours. Remember any investor can go on AngelList and find a thousand startups that are raising money. Why does any investor invest in any one startup? It's because of the story. I can't overstate this enough. Investors invest in you and your story. Storytelling is millions of years old and it's how humans understand reality. We understand the world around us in terms of stories. So as you practice your pitch, you're going to be able to see whether the story that you're telling is a good one and is compelling, is captivating or not, and if it's not, you have to go back and refigure the pitch. You know all the research that you did in step 1, the vision and the supporting materials are all going to stay the same, but the story is going to be different. For example, with Kindara, I pitched it first as a birth control app. Then I pitched it as a pregnancy app. Then I realized, wow, this is a fertility management platform. And then I realized, well actually what we're building is a technology platform to help women track their fertility from when they first get their period all the way through to menopause and it's actually bigger than any one phase of a woman's life. And that was the story that resonated because I truly believed it and it was big and exciting. I believed that a platform like this needed to exist and that if we didn't build it somebody else would. That story was big enough and exciting enough that people wanted to invest in it. So step two, practice the pitch. Craft the story. As you do this you're going to find that there's 10 or 15 ways to pitch your particular idea and to paint the story and you're going to have to hone in on what is the most compelling story that is compelling to you, that you believe in in your bones, and that is also compelling to the people that are listening to the pitch. So practice, practice, practice. You could even try to pick three storylines, make three pitches and three storylines and practice and with people and try to find what resonates, what feels good for you, what makes you excited to lie in bed at night and think about, and what captivates people when you're pitching it to them. So that's step two, practice. One other thing on step two, not only is this practice allowing you to craft your story, but it's also allowing you to practice pitching. You need to get accustomed to the weird activity that is getting up in front of a room of people or sitting down with somebody and pitching them on your startup and why they should invest in it. And one thing that I always try and remind people and that I always kept in mind whenever I was raising money is pitching is selling. You're selling your startup, and in sales, everything that comes out of your mouth either takes you closer to the sale or further from the sale. So you are going to through practice, notice that there's certain things you say that take you away from the sale and every time you say one of those, you're gonna remember "Wow, I should never say that again" and you're going to get better. Like someone will ask you a question, you'll say the answer and it'll be a total buzzkill and you'll realize, wow, I shouldn't say that. And then you won't say that next time someone asks you that same question. So that's the other benefit of practicing is it helps you get the story and it helps you to practice pitching and figure out what words you want to use that feel good and takes people towards the experience of wanting to invest in your idea. So step two is done when you feel confident pitching and feel confident answering all the questions that people ask you. You might even make supplementary slides in your deck for the most common questions. Then when people ask you those questions, you can say, I actually have a slide for that. Pull it up and show them. Note: if you are raising money for your startup and want help, please don't hesitate to get in touch.